Today I want to talk to you about palliative care, what it is and when it might be appropriate towards the end of your dog or cats life. Whether your pet has been diagnosed with cancer or if they are old and just generally deteriorating. If they've been diagnosed with some other untreatable condition or if for whatever reason you're not wanting to pursue any further investigations or diagnosis. Palliative care is something you should strongly consider for your furry family member. My thoughts today were actually prompted by a recent lecture that I attended. If you who follow me on twitter (and if you don’t then why not! ), you'll know that I was fortunate enough to attend the WSAVA (World Small Animal Veterinary Association) Congress, 2018; a 4 day conference held in Singapore. If you watch the video above you can see some pictures of the area! What is cat and dog palliative care? What then is palliative care for pets? Really, it's all about trying to optimize the quality of life of our dog or cat and holding this as the most important thing above everything else. We're not really focusing on quantity of life (or how long they're going to live). We really want to optimize quality of life so that the time they have left with us is as happy, comfortable and as full of joy as it can possibly be. We do this by trying to address whatever it is that is causing our pet to struggle with their day-to-day life, and reducing the symptoms of whatever is causing them pain or distress. This involves addressing several key aspects in a pets day-to-day care. First though you should be very clear about what your beliefs are as a family and what your end goals are. If you’re thinking that you just want your pet to be around forever then unfortunately that's just not going to be possible. It’s really important to have realistic expectations and realistic goals, and for each individual pet and for each family this will be different. One thing that is worthwhile to do is record what the key quality of life indicators for your pet are. If they're really into their food, then stopping eating might be a key thing that says your pet is starting to suffer and their quality of life is deteriorating. If they love their walks and they're starting to become really reluctant to go for walks or they're not exercising with their normal enthusiasm, then that might be the kind of a key quality of life indicator for your pet. If they're not interacting with the family, they're not going to your children to play or for cuddles then once they stop this then that might be a key quality of life kind cut off for you and your pet. Remember we need to put quality of life above everything else. Every pet will be different and every family will have different goals and aims for their pets end of life care. You know your pet much better than we as vets ever can. We get such a small snapshot of what they like at the vet clinic, it's also a stressful environment and so they may also behave very differently. Having a think and then communicating your goals with your vet is very important. If they know what the lines in the sand are for you and your pet then they can better help formulate a plan to maximize quality of life. You also need to be realistic and honest about what you want to do and what you will be able to do. If your vet is suggesting doing x, y and z, but you would simply be unable to give a specific form of medication or carry out a suggested intervention you really must let your vet know. Let them know that you're going to struggle (or you’ve tried and are unable to make the plan work) because there may be other options. As vets we can only know that something either isn't working or is just proving too difficult if you let us know. We can come up with an alternative plan so don't be afraid to share this vital information with us. Pain relief plays a huge role in palliative care. A lot of conditions that present towards the end of life are painful. This includes cancers, chronic end stage arthritis, various intestinal and organ diseases. They all have the potential to result in pain. Being aware of this and monitoring your dog for signs of pain (which are different to the signs of pain in cats) is really important. If there is any doubt then even just trialing a course of pain killers can help make absolutely certain that your pet is as comfortable as possible. Depending on your pets underlying condition the actual drug used will vary from something like a NSAID anti-inflammatory painkiller through to something that is more suited to nerve pain like gabapentin. There really are a number of different options that are likely to be suitable for most of our patients. Making sure your pets appetite is maintained and is eating appropriately is the next palliative care step. Adequate nutrition is key to maintaining the bodies condition wherever possible. Even if your pet is not doing much in terms of activity, being in a disease state generally means that an individual is suffering from an additional drain on energy and nutrients. If your pet starts to go into a negative energy balance, that is they are not eating as much as their body is burning, they can experience rapid weight loss and overall body decline. This will vary for each different condition your pet might be suffering from. If it is causing them to vomit then stopping this is important. If it is causing them to struggle for breath because fluid is building up in their lungs then diuretic treatment might be needed. If they have a discharging, ulcerated mass then antibiotics may help. If your pet is experiencing anything that is impacting their quality of life then let your vet know. Interacting with your pet is also so important. Keeping them stimulated and engaged members of the family is a major part of their life and making sure they are as happy as possible. You might think that surgery is an extreme option when it comes to palliative care and end of life treatment for your dog or cat. In many cases it might be, or certainly not be something that you’d want to put your pet through. In some situations though it might be the only option apart from euthanasia. It might be that your dog has suffered a fracture because of a bone tumor and so amputation is the only option left to you. They may have an ulcerated, infected mass that can only be managed by being removed despite having already spread to other parts of the body. If you're not ready for euthanasia for whatever reason, then surgery might need to take place. It is essential though that you are clear about the aims of the surgery, the time-frame for recovery and the likely life expectancy of your pet following surgery. It is only with all this information that you can make a true decision based on what is best for your pet going forward. The take home message is again that we need to put our pet's quality of life above everything else. When is end of life care for pets appropriate? So when is palliative care appropriate and at what stage should you consider it for your dog or cat? Palliative care is something that is most appropriate when our pet has received a diagnosis of something that's incurable and ultimately fatal. This might be in the near future or, in the case of slowly progressing diseases, something that will actually take a much longer period of time. Equally, it might be a treatable condition but for one reason or the other (and there are potentially many reasons) you’re not wanting to pursue treatment. This might be because of the cost or the intensity of the treatment that you feel your pet wouldn’t be able to cope with. A typical example of this would be certain chemotherapy regimes which involve frequent blood testing and the administration of different medications in the veterinary hospital. Not wanting to pursue treatment could also be because the prognosis with further investigations or treatment is actually really poor and you decide that this wouldn’t be in the best interests of your dog or cat. So whatever the reason, if the condition itself could potentially be treated but we don't want to go down that path then palliative care can certainly be appropriate. Another time would be if our pet is just getting very old or suffering from a number of different, non-fatal issues, such that their quality of life is starting to suffer with there being very little prospect of improvement. Should you start palliative care now or delay? Another question might be when should we start palliative care? Really, the simple answer is the earlier the better. It is apparent that when human palliative care is started early, the quality of a persons life at the end of life is much better. Also as a byproduct of starting early, the actual quantity of life is improved as well. When palliative care is started early your pet is likely to be both happier and live longer. So if your pet is suffering from any of the situations I discussed above, then actually starting to think about palliative care in the really early stages is going to be of big benefit to your pet. You'll have them with you for longer and there'll be a lot happier and an integrated member of the family for that period of time as well. The importance of this can’t be overstated. You’ll be sick of reading this by now but it is that important and we can only know what actions to take if we know how our dog or cat is feeling. I discuss how to measure and record your pets quality of life in my article all about the right time to euthanize your pet. Euthanasia is a really valid decision to take when your pet is faced with a condition that they're not going to recover from, and especially so when their quality of life is starting to suffer. No discussion about end of life care is complete without at least mentioning euthanasia. The two topics definitely go hand-in-hand with each other. 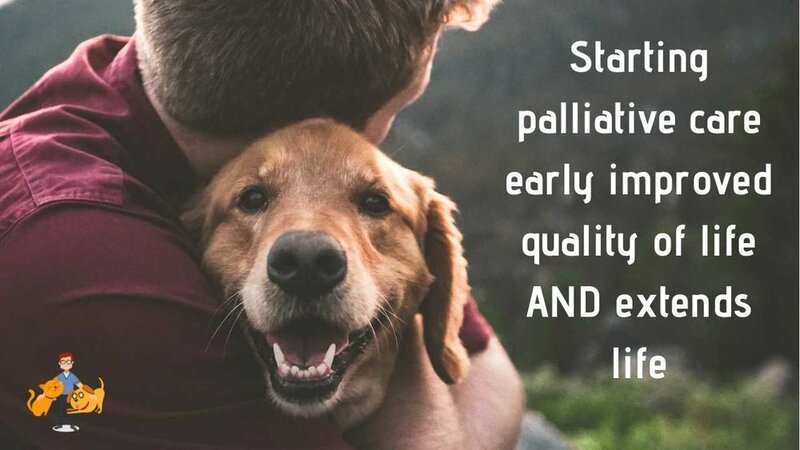 Starting your cat or dog on a palliative care plan early may though allow us to delay that most difficult of decisions, and even if we are unable to extend their life we can be certain we have made their remaining days, weeks or months as happy and comfortable as possible. Our Pets Health: because they're family.